In 2017 more than 70 percent of the world’s adults own under $10,000 in wealth. This 70.1 percent of the world holds only 3 percent of global wealth. 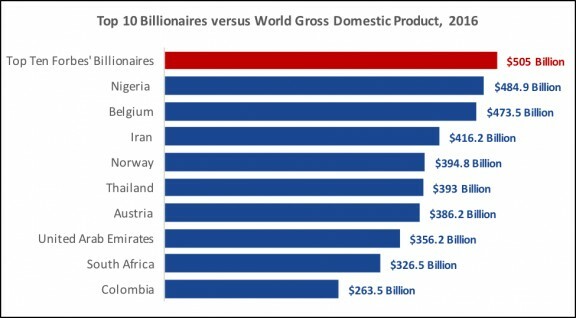 The world’s wealthiest individuals, those owning over $100,000 in assets, total only 8.6 percent of the global population but own 85.6 percent of global wealth. This disparity creates a clear ethical dilemma summarised by Thomas Pogge in the clip below. One prominent figure seeking a solution to this dilemma is French philosopher Thomas Piketty. In this next video he describes the thesis of his book Capital in the 21st century and details his belief in the need for a progressive global tax on wealth assets. Whether you believe in Piketty’s proposed solution or not, wealth inequality is current concern and an impending disaster. As the gap between rich and poor widens due to the advent of productive automated technologies, pressure is sure to build on those whom refuse to adapt to the realities of wealth inequality.